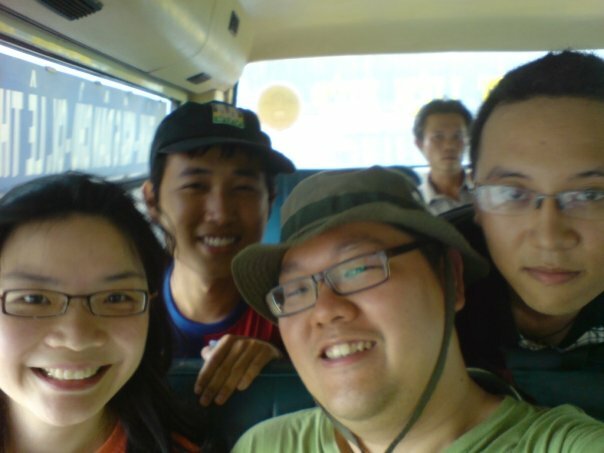 We arrived in Ho Chi Minh on the 30th April 2009, Thursday. On Arrival, upon clearing the immigration, we grab our luggages and head towards the taxi stand. Just on the left hand side upon exiting the airport. 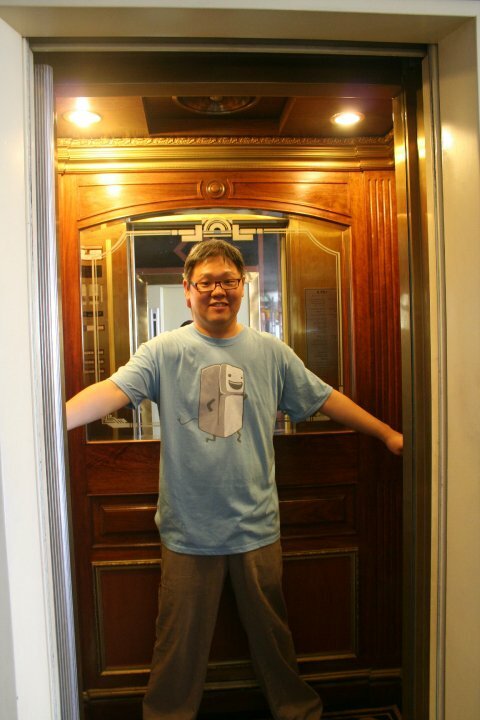 The trip to our Hotel cost us around 130,000 Dong… (it was around $90,000 Dong on meter). Driver claims that it cost more because of entrance from the airport. I was a bit surprise, and requested him to issue me a receipt. with that request, he lower his charges to 120,000 Dong (US$8). 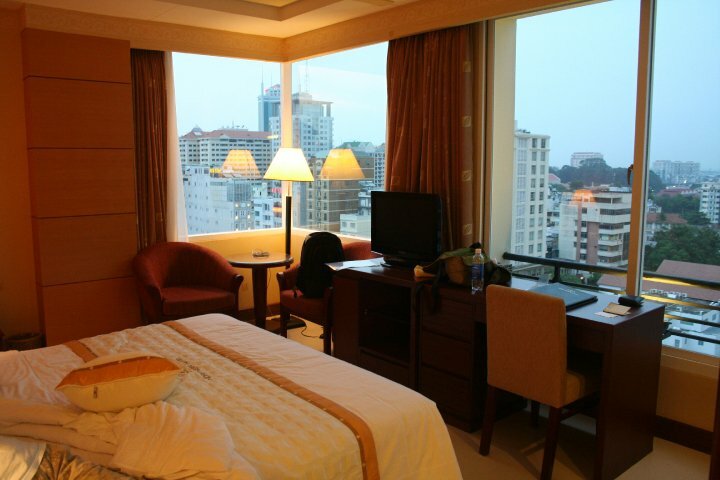 For our 3 nights in Ho Chi Minh, we stayed in Northern Hotel. It is a new hotel (Established Sept 2008) and we thought of pampering ourselves with a newer hotel in Saigon, given we have only 3 nights in the City. It cost us US$85++ a night for a sunrise duluxe room. Hotel is new, breakfast is decent and we felt that the room is probably around 3-4 star. First day, we just wander around Dong Khoi Street (Orchard Road of Saigon). Mid-High end boutique. Nice to do window shopping but probably over priced in Saigon standard. After walking in the hot sun, we have some ice-cream at Fanny. 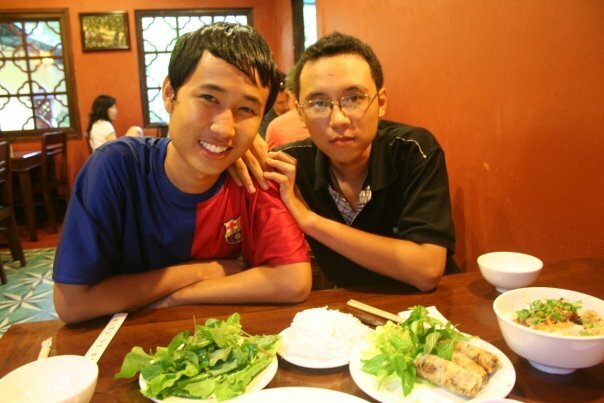 We dine in Lemongrass Restaurant (Nguyen Thiep). Felt that it is a bit over price and nothing too fantastic. Today we are meeting Khoi & Quang from Saigon Hotpot. 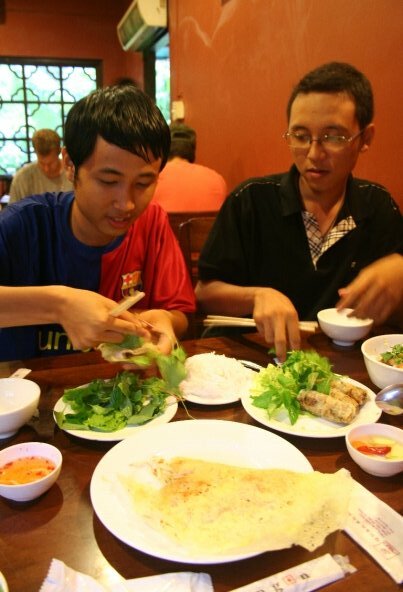 Both Khoi & Quang are currently studying in the university and they are members of Saigon Hotpot, a non-profit organisation. 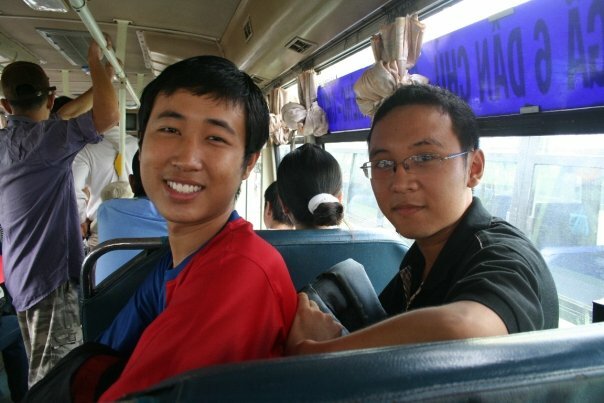 With them being our guide, we took a public bus to Cu Chi Tunnel. 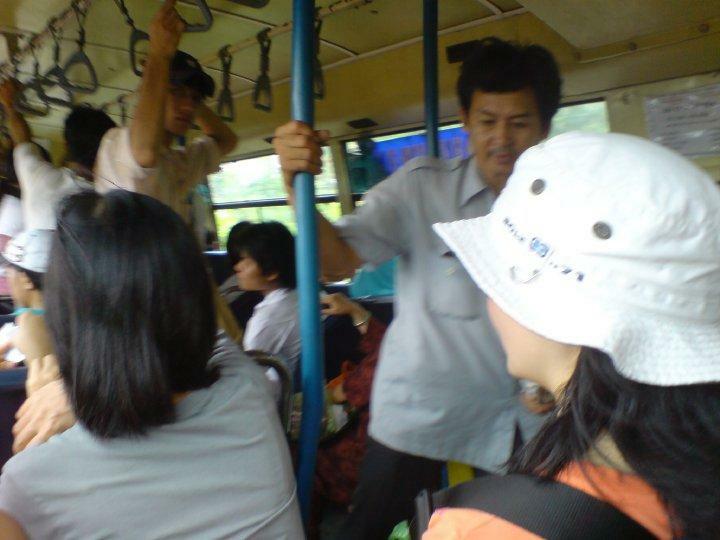 Though the journey took us 2 hours per way, we enjoy taking the bus with the locals and observing their live and culture. Vietnamese are really friendly and kind people. Once the bus door starts to open, everyone will rush to get a seat, however, I am amazed how they are willing to share their seat with people (3 person in a seat). I witness numerous occasion where the bus conductor and people in bus, trying to find a seat for older folks. If a seat cannot be found, you can be sure, that a young person will give up their seat. 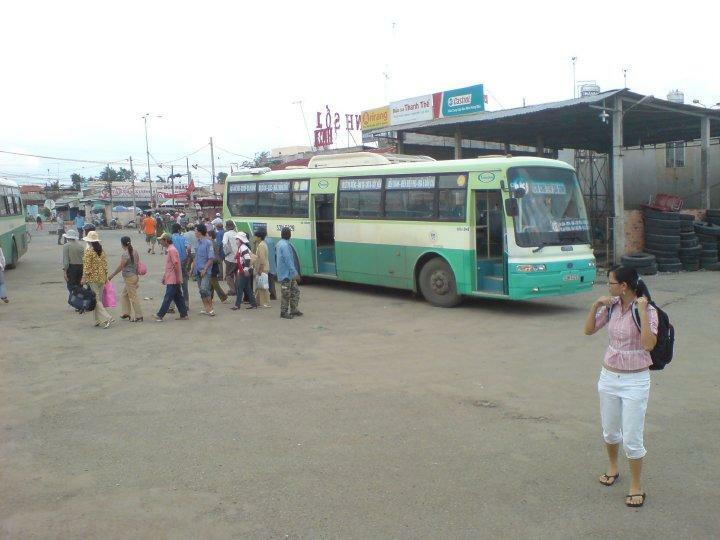 Bus fare is around 5000 Dong (Saigon –> Cu Chi Town) & 3000 Dong (Cu Chi Town –> Cu Chi Tunnel) one way . Our trip for 4 person, I paid less then US$3 for all. 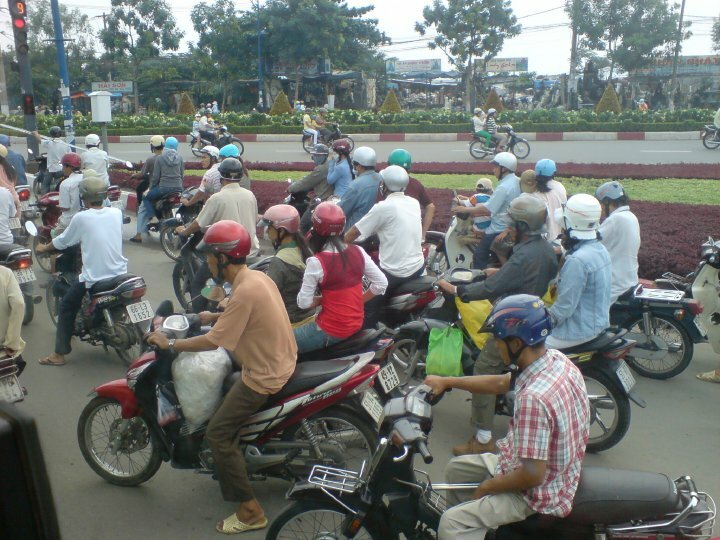 Upon reaching Cu Chi Tunnel, we were met with a large crowd, not knowing that it is a public holiday in Vietnam. 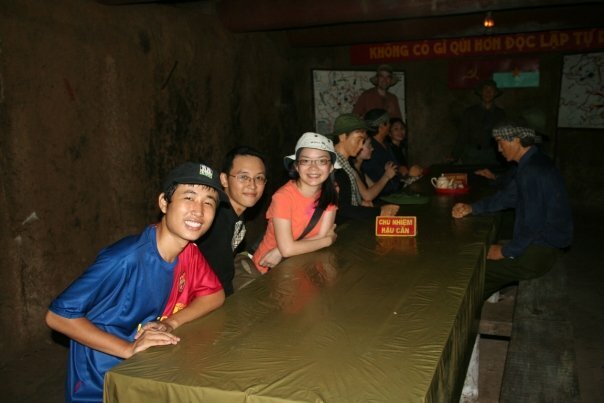 Being a foreign tourist in Cu Chi Tunnel, we have to pay a higher fee to enter. However, the higher cost comes with a guided tour that bring us around the Cu Chi network, away from the crowd, having more time to appreciate the engineering marvel of the Tunnel network. 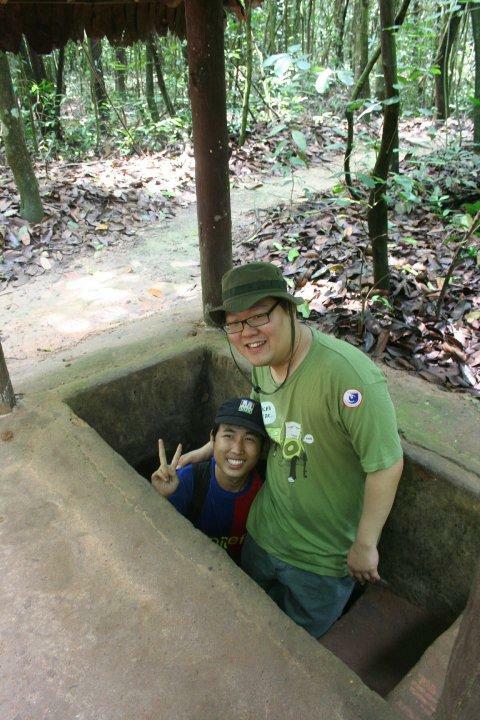 We did not spend too long in Cu Chi Tunnel. At around 11.30am, we make our way back to Saigon. We reached Saigon at around 2.30pm. Khoi & Quang brought us to Quan An Ngon for lunch. We love the food here. You can find all Vietnamese street food at this restaurant. We have a hearty meal and it cost us less then US$30. Next Khoi and Quang brought us to the War Museum. The artifacts in the museum is nothing to shout about. However, the collection of pictures really show the devastation of war. Knowing that my wife love to shop, Khoi and Quang brought us to Saigon Square. We kind of like Saigon Square. Both me and my wife each bought North Face Windbreaker for less then US$20 each. After shopping, we stop by Highlander Cafe for coffee & cakes. We spend the rest of the evening talking and learning each others language and culture. Today we met Ngi & Giang from Vietnam Connection.Both Ngi & Giang are currently studying in the university and they are working part-time in Vietnam Connection. 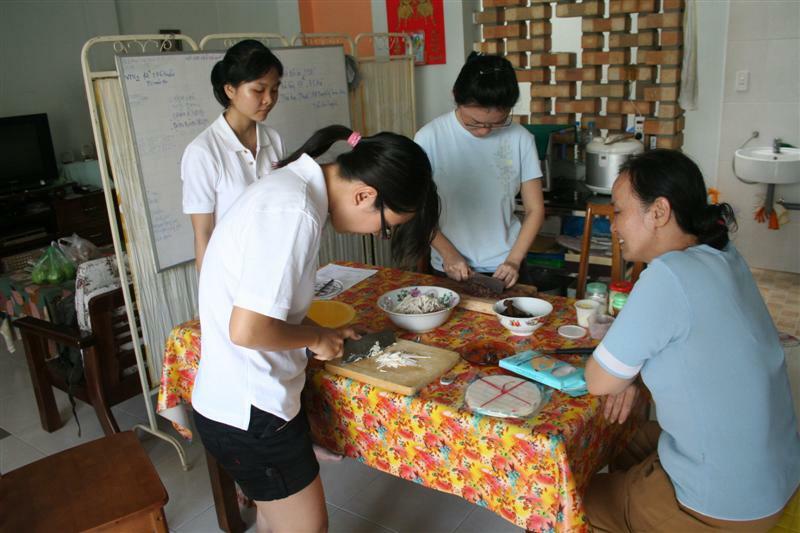 Today we are going for a cooking class with them! We took a cab to our destination – Chef House, where we will be learning to cook Pho & Vietnamese Springroll. We met chef and her helper (we do not really know their name, we know them as chefs :)). After a short chat (through interpretation by Ngi & Giang), we went to the nearby wet market to purchase our ingedient for our lesson. 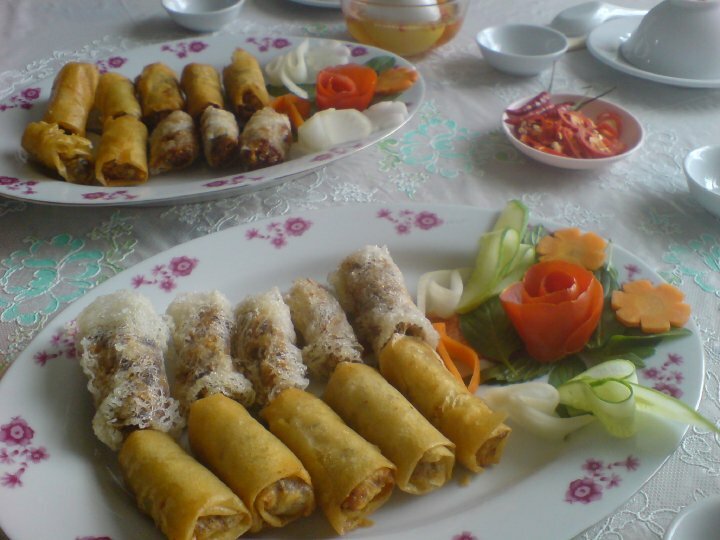 Back to our Chef House, we started to prepare Vietnamese Springroll. After which, we started to prepare Pho. The food is really tasty, probably with the additional sweetness from our labour. We are all happy with the food..
At 2pm, we bid goodbye to our Chef. 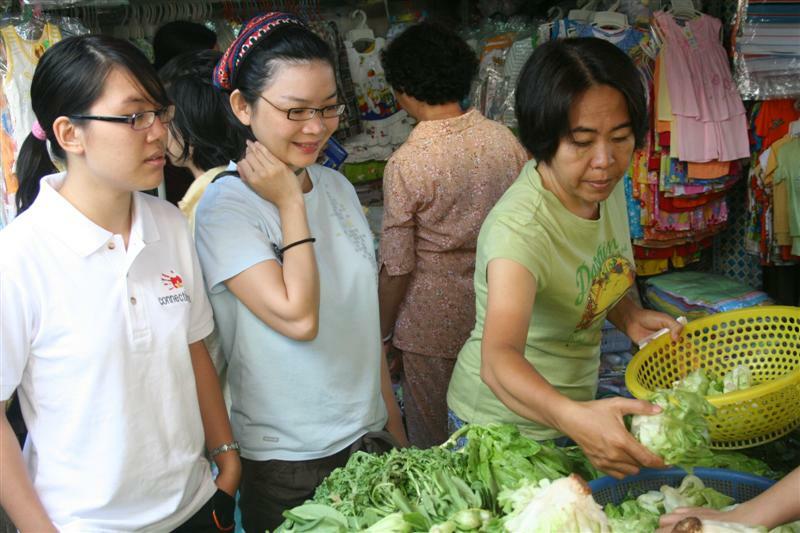 Ngi & Giang next brought us to Bing Tay market to buy all our snacks and nuts to be given to our friends and relative. As Bing Tay is a wholesale market, we felt that the place is a bit unfriendly and diffcult to navigate. Even Ngi & Giang felt a bit lost and intimidated in Bing Tay. After buying the required gifts, we left the place back to our hotel. After a short rest, we left our hotel and walked to the General Post Office. We proceed on to Ben Thang Market. On Our way, we stop for coffee. We bid goodbye to Ngi & Giang while we spend a short time in Ben Thang and its surrounding. After a day of “working” and walking, we decided to go for a massage at a Spa near our hotel. Mary did her padicure as well. We felt that the massage was so-so. We prefer the massage in Thailand and Bali. We end the day having our dinner at a nearby cafe before having a good rest for our trip home the next day. We met up with Khoi & Quang today for the last time to do some last minute shopping and to do some catch-up before we leave for Singapore. 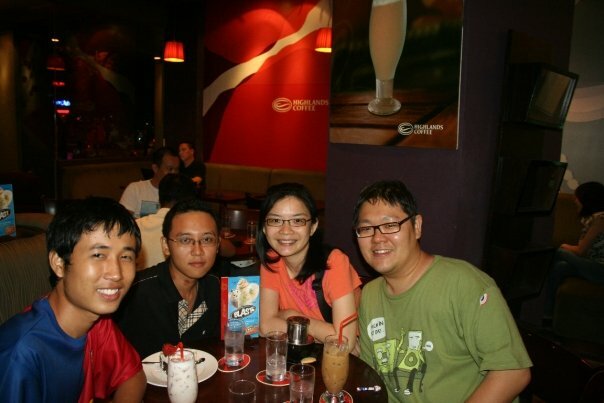 We were really thankful and appreciate the friendship of Khoi & Quang. They are really very helpful and attentive to our needs. Beside bringing us to various attraction, they have show us the live and culture of Vietnamese people. In Ho Chi Minh, though the sights and scene is not as great as Australia, the people and culture is something that we enjoy in our trip. 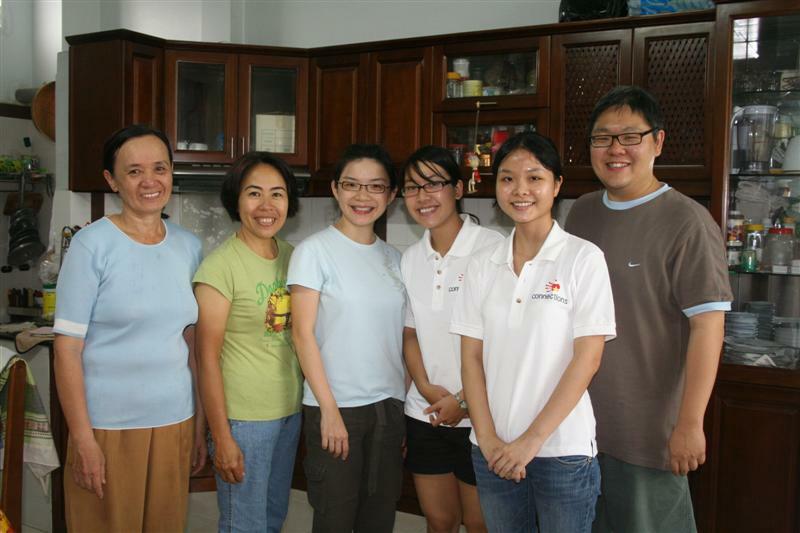 We thank Khoi, Quang, Ngi, Giang and Chef for making our trip in Ho Chi Minh such a wonderful experience.